I love when food trucks visit my neighborhood. I'm too lazy to track them on Twitter, but I'm not too lazy to run down the street if I happen to see them nearby. 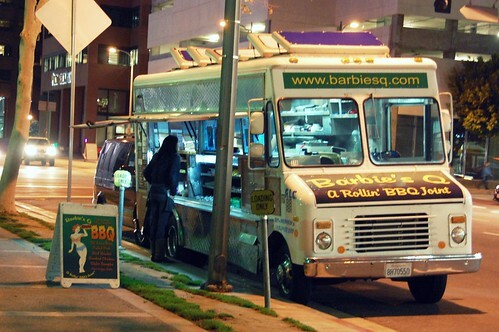 Barbie's Q is barbecue on wheels. The menu is simple. 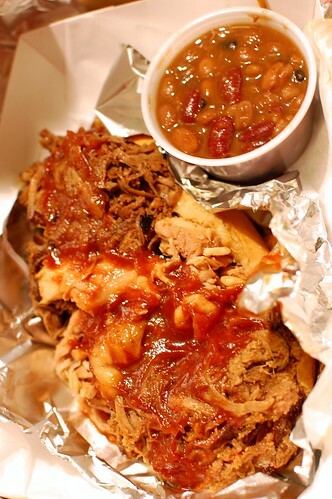 "Q" Sampler -- pulled pork, BBQ beef, and smoked chicken served with your choice of Barbie's homemade side dishes ($8). This was a good way to try several meats in one dish. 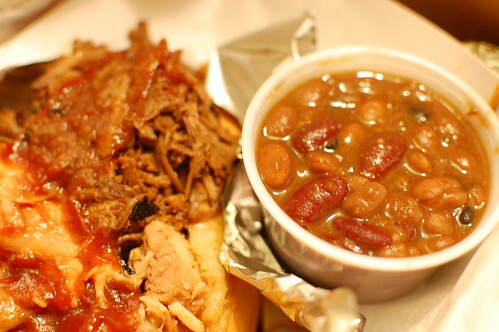 I chose barbecued beans as my side, which were excellent. Surprisingly, I liked the chicken the most. Pork came in second, and beef was a more distant third. The chicken was extremely tender, juicy, and flavorful. 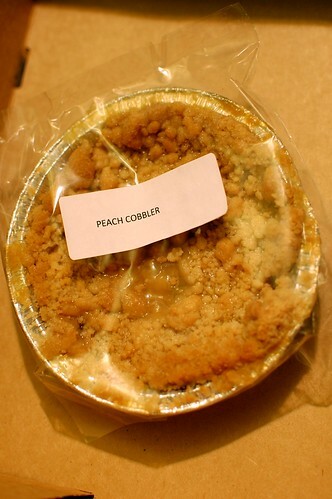 Don't let the plastic-lid-flattened top fool you. 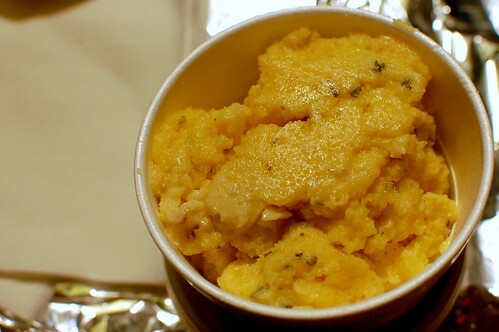 These grits were pretty tasty. Very good. Quite cheesy. Not mushy. Thumbs up. 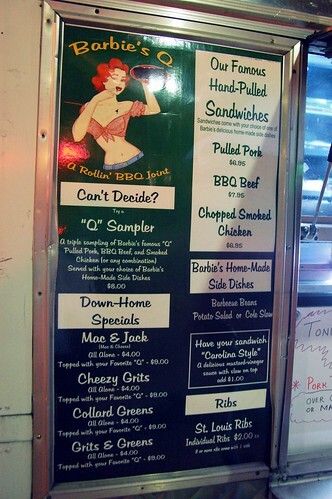 Barbie's Q didn't inspire me to start tracking trucks, but I'm happy to have spotted it and liked my mobile meal. I'll be on the lookout for that! Mmmm! I loved Barbie's baked beens too. Yummm! As Liz Lemon would say: I want to go to there. We just started getting food trucks down here (well other than the taco trucks we already have). Very exciting. 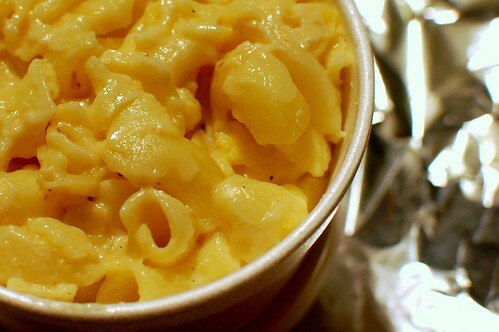 i'm really not a huge BBQ fan, but i dig sides like mac & cheese. at least you GET food trucks. out here in "the middle of nowhere" we're lucky to have ice cream trucks. 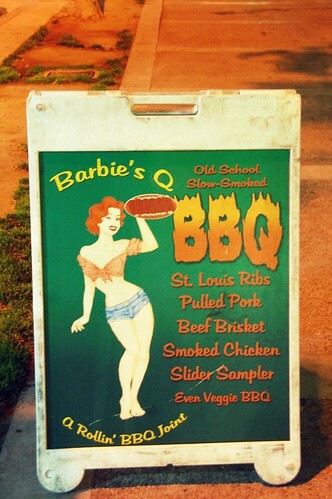 I really enjoy their food, and you can't help but love the Barbie's Q guys. They're adorable. this lazy non-tracker got to try some of her friends' food from barbie's q. yum. but i think i'd rather just get takeout from spring street smokehouse instead of tracking a truck. lazy. If a food truck pulled up down the street from me I think I might die of excitement. i can't keep track of all these trucks. now that you've pointed barbie's q out, i will have to look for it...in a very passive, not hunting down for it kind of way. Mmmmmm! We have a local, weekend only bbq place that sets up shop in the parking lot of a gas station that we've yet to try. This reminded me that it's on our list. ha! instead of driving an icecream truck like i did the summer of my 1st year at college, i should have driven the Julie/Barbie Q Truck! I am fascinated by this.